Form a hopelessly fractious political coalition on the back of four years of doing nothing with county governments to demonstrate your chops at transformative governance. Successfully push for electoral reforms, and then sit on your hands trusting that the system will work. Engage in all manner of self-sabotage during the campaign period, including failing to push for grassroots voter registration, having a unity message, reaching out to wavering voters, and credibly committing to reform the public sector. Fail to agree on a common slate of candidates ahead of the election, thereby granting the incumbent party a significant sweep of legislative and county seats. Fail to prepare for the logistical nightmare of coordinating poll agents across the country, thereby making it possible for the incumbent party to pad results where needed. Get lucky at the Supreme Court, but without a plan on how to prepare for a fresh election 60 days after the ruling. Try to push for more electoral reforms and a postponement of the election. When that fails, boycott the re-run presidential election. Half-heartedly boycott Parliament and other state institutions. Promise to swear in your presidential candidate as a bargaining tactic, but without a way out of the plan in case the incumbent government calls your bluff. Meanwhile, stay hopelessly off-message at every turn, and play into the narrative of being a disruptive alliance of sore-loser crybabies that would be no different than the incumbent party at governing. Sow distrust among your core leadership by failing to share important legislative committee seats in good faith. Swear in your presidential candidate as “The People’s President” (an office not provided for in the Constitution) as an act of defiance, but with no real public agenda or explanation of the act’s real impact on Kenyans’ lives. If you do these things, you will cause a COMPLETE FREAKOUT in the Kenyan government. They will shut TV stations. They will scream treason. They will withdraw the security detail of opposition politicians. They will declare you members of a criminal gang. They will risk unnecessarily plunging the country into a security crisis. They will drop the focus on the president’s potentially transformative Big Four agenda. They will behave like they will be in office for life. They won’t care about the negative precedences they are setting. They will forget that in five years they will be out of office, and might face a less benevolent, but way more competent tyrant that will eat their lunch and dinner. Here are three factors that could potential lead to a surprise outcome in Kenya’s presidential election tomorrow. For some time I have been wrestling with an ethical problem. Reviewing the 2013 turnouts, in comparison with that from previous national elections since 2002, it became clear with the benefit of hindsight that turnouts were implausibly high not just in Luo Nyanza and Central Province, but in many other places…….. The size and scale gap between 2013 and every other election for the past 15 years is hard to explain. In other words, there is good reason to believe that the 2013 turnout figures were artificially high. The use of technology and a raft of reforms, including the planned announcement of results at the constituency-level, are supposed to minimize opportunities for political parties to gin up turnout in friendly areas this time round. If these safeguards work, we will all be flying blind with regard to our turnout-based predictions of the final outcome in the presidential election. All I can say for now is that Kenyatta has a structural advantage over Odinga on likely turnout, but that if Odinga matches Kenyatta on turnout (especially in Coast and Western regions) he will most likely become Kenya’s fifth president. 2. Technology: The Kenyan public’s perception of the integrity of the polls will crucially hinge on how well the IEBC’s Kenya Integrated Electoral Management System (KIEMS) is judged to work. Kenya is holding one of the most expensive elections in the world (judged by cost per vote). And the use of expensive technology has been touted as a way of minimizing human discretion and, therefore, opportunities for vote rigging. But technology only works as well as humans allow it to. And sometimes stuff hits the fan. In addition, the IEBC only partially tested its results transmission system. Which means that there will most likely be hiccups in the data transmission process from the country’s 40,883 polling stations. Widespread technological failures will tarnish the integrity of the outcome, and could be a catalyst for political instability. 3. 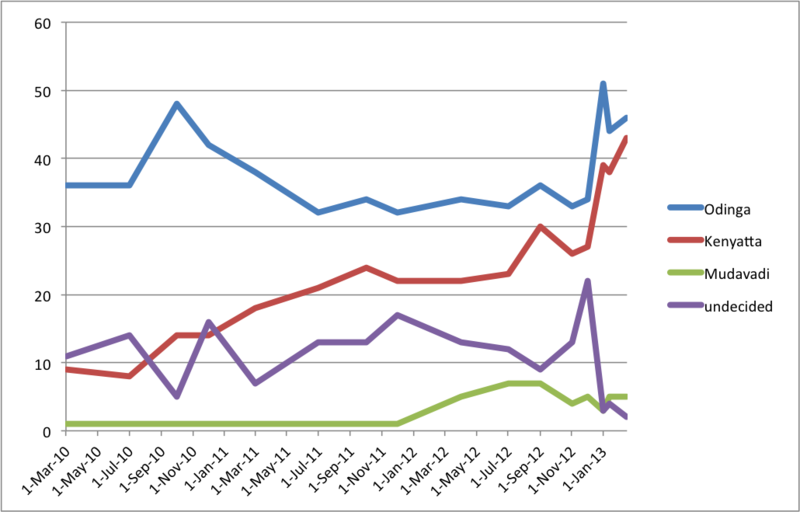 The accuracy of opinion polls: Throughout this cycle, all polls except one have shown Kenyatta to be ahead of Odinga. In the recent past the polls have certainly tightened, with Kenyatta leading Odinga by 3 percentage points or less. But what if the polls are wrong? In 2013 they underestimated Kenyatta’s support by about 2 percentage points, on average. The same inherent bias may be at play this year, or it could be reversed. One important factor to look out for will be the effect of local gubernatorial races on the presidential race. For instance, the outcomes of local contests in counties like Machakos, Bomet, Narok, Meru, and Bungoma will likely have non-trivial effects on the presidential race in the same counties. Yet throughout this cycle there has been very little effort to calibrate the national polls using information from the state of county contests. And so while I believe that existing opinion polls give a fairly accurate depiction of the state of the race, only the final vote counts will tell. This is a longer version of my column in the Standard this week. This week the leading political blocs in the upcoming General Election released their respective manifestos. Jubilee sought to convince Kenyans that it needs another term in office to finish the job it began in 2013. The National Super Alliance Coalition (NASA) presented an agenda for the full implementation of the 2010 Constitution, focusing on equity and inclusivity. Both documents present competing visions of where we are as a country, and where we ought to go. On one hand, Jubilee which sees the country’s problems as rooted in poor infrastructure and a lousy business environment. Its vision of government intervention in the economy is thus driven by the need to facilitate private investment (mostly through crony capitalism, but also through streamlining of the regulatory environment). But on the other hand is NASA, whose manifesto suggests a firm belief that the ambitious 2010 constitution has yet to be fully implemented; and that the country still requires structural transformation in order to guarantee equitable sharing of national resources, social inclusivity, and equality before the law and the government. On a spatial left-right scaling, NASA’s manifesto is decidedly to the left of Jubilee. This is reflected in both the specifics in both manifestos and the choice of words in the documents. NASA (see image below) envisions a much bigger role for the government in the effort to transform Kenyan lives than does Jubilee (see above). Both manifestos and visions for Kenya’s future have merits and demerits. Jubilee has a case to make for working with the country we have without re-litigating the political settlement of 2010 and its (partial) implementation since 2013. Restructuring society does not always yield the desired results, and often comes with instability. Their vision of doing their best to build infrastructure and letting hardworking Kenyans do the rest makes sense if one believes that you go to battle with the army you have. Their proposed vision of Kenya is grounded in the idea that a rising tide, even if marked by high levels of inequality, lifts all boats. Simply stated, it is a vision that prizes ends rather than means. A priori, it is hard to say which vision fits the country best at this point in our history. Kenyans who have seen their lives improve over the last four years will most certainly want to eschew any radical changes — this is true, despite recent worrying headline economic numbers. Those who have seen their economic situation stagnate or worsen want change now. Looking at the numbers, there is ample evidence in support of either argument. This is why, unlike some partisan observers, I see no reason to worry that the world would end if either Jubilee or NASA wins. The truth of the matter is that life will go on as before — with messy and contested politics at every turn, and high levels of economic inequality. It is extremely hard to change or ignore social forces. If Jubilee wins, it will be hard to continue ignoring issues of equity in perpetuity. Eventually, even diehard Jubilee supporters will realize that the crumbs that fall off the table are a raw deal. In the same vein, a NASA win will not necessarily produce a radical transformation of the Kenyan state. Once in power, the coalition’s leadership will most certainly be disciplined by our unwieldy political economy dominated by so-called cartels and our general structural conservatism. As a student of political development, all I can say is that either path will lead to further consolidation of our political economy — either through further entrenchment of a hierarchical order (under Jubilee); or the widening of the economic upper class (under NASA). Below is a list of what I consider to be the highlights of both manifestos. Consistent with the claims above, the Jubilee manifesto has specifics on many of its promises, while NASA’s largely sets out frameworks within which it will seek to transform Kenyan lives and the nation-state. Kenya will hold a General Election on August 8th of this year. The national-level elections will include races for president, members of the National Assembly, and the Senate. County-level races will include those for governor (47) and members of County Assemblies (in 1450 wards). This post kicks off the election season with a look at the presidential election. 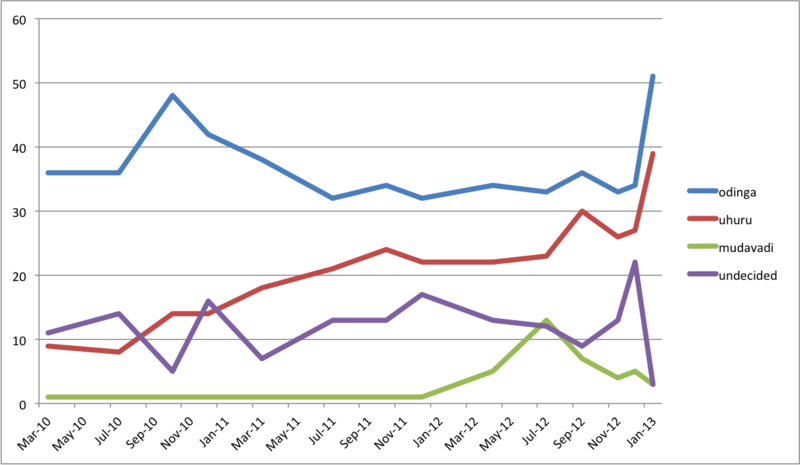 I also plan to blog about the more exciting gubernatorial races in the coming weeks. Like in 2013, the contest will be a two-horse race between President Uhuru Kenyatta (with William Ruto as his running mate) and Hon. Raila Odinga (with Kalonzo Musyoka). The convergence on a de facto bipolar political system is a product of Kenya’s electoral law. The Constitution requires the winning presidential candidate to garner more than half of the votes cast and at least 25 percent of the votes in at least 24 counties. In 2013 Kenyatta edged out Odinga in a squeaker that was decided at the Supreme Court. Depending on how you look at it, Kenyatta crossed the constitutional threshold of 50 precent plus one required to avoid a runoff by a mere 8,632 votes (if you include spoilt ballots) or 63, 115 (if you only include valid votes cast). In affirming Kenyatta’s victory, the Supreme Court ruled in favor of the latter approach. But despite the court’s ruling, a significant section of Kenyans still believe that Kenyatta rigged his way into office, and that Odinga should have won. My own analysis suggests that it was a little bit more complicated. I am fairly confident that Kenyatta beat Odinga in the March 2013 election. But I do not think that he crossed the 50 percent plus one threshold required to avoid a runoff. At the same time, I am also confident that Kenyatta would have won a runoff against Odinga. All to say that I think the results in 2013 reflected the will of the people bothered to vote. This year will be equally close, if not closer. Odinga has a bigger coalition: The third candidate in 2013, Musalia Mudavadi, is joining forces with Odinga this time round – as part of the National Super Alliance (NASA). Mudavadi managed to get just under 4% last time and will provide a much-needed boost to Odinga’s chances in Western Kenya and parts of the Rift Valley. Kenyatta has had a mixed record in office: The Kenyan economy has grown at more than 5% over the last four years. The same period saw massive investments in infrastructure — including a doubling of the share of the population connected to the grid and a brand new $4b railway line connecting Nairobi to the coast. However, these impressive achievements have been offset by incredible levels of corruption in government – with senior government officials caught literally carrying cash in sacks. Kenyatta is also stumbling towards August 8th plagued with bad headlines of layoffs and the ever-rising cost of living. Barely two months to the election, the country is in the middle of a food crisis occasioned by a failure to plan and a botched response that appears to have been designed to channel funds to cronies of well-connected officials. The Rift Valley: In 2013 much of the Rift Valley was a lock for Kenyatta (it is William Ruto’s political back yard). This time will be different. Parts of Ruto’s coalition in the Rift, particularly in Kericho and Bomet counties, may swing towards Odinga this year. All Odinga needs is about a third of the votes in these counties. I expect both campaigns to spend a lot of time trying to sway the small pockets of persuadable voters in these two counties. The Kenyatta Succession in 2022: In 2013 Kenyatta was elected as the head of an alliance, not a party. In 2017 he is running atop a party, the Jubilee Party (JP). It is common knowledge that JP is William Ruto’s project. Because he plans to succeed Kenyatta in 2022, he desperately needs credible commitment from Kenyatta and his allies that they will support his bid when the time comes. JP is an installment towards this goal, and is designed to allow Ruto to whip party members in line during Kenyatta’s second term (on a side note, Ruto needs to read up on the history of political parties in Kenya). But by forcing everyone into one boat, JP may actually end up suppressing turnout in key regions of the country, the last thing that Kenyatta needs in a close election. The ICC factor (or lack thereof): Because of their respective cases at the ICC, 2013 was a do or die for Kenyatta and Ruto (and their most fervent supporters). This time is different. Both politicians are no longer on trial at the ICC, and so cannot use their cases to rally voters. The lack of such a strong focal rallying point will be a test for Kenyatta’s turnout efforts. Nearly all of the above factors sound like they favor Odinga. Yet Kenyatta is still the runaway favorite in this year’s election. And the reason for that is turnout. As I show in the figure below, the turnout rates were uniformly high (above 80%) in nearly all of the 135/290 constituencies that Kenyatta won in 2013. Pro-Odinga constituencies had more spread, with the end result being that the candidate left a lot more votes on the table. The same dynamics obtained at the county level (see above). In 2013 Odinga beat Kenyatta in 27 of the 47 counties. The counties that Odinga won had a total of 8,373,840 voters, compared to 5,977,056 in the 20 counties won by Kenyatta. The difference was turnout. The counties won by Odinga averaged a turnout rate of 83.3%. The comparable figure for counties won by Kenyatta was 89.7%. At the same time, where Kenyatta won, he won big — averaging 86% of the vote share. Odinga’s average vote share in the 27 counties was a mere 70%. The same patterns may hold in 2017. The counties won by Odinga currently have 10,547,913 registered voters, compared to 7,556,609 in counties where Kenyatta prevailed. This means that Odinga still has a chance, but in order to win he will have to run up the numbers in his strongholds, while at the same time getting more of his voters to the polls. Given the 2017 registration numbers, and if the turnout and vote share patterns witnessed in 2013 were to hold this year, then Kenyatta would still win with 8,000,936 votes (51.5%) against Odinga’s 7,392,439 votes (47.6%). The slim hypothetical margin should worry Kenyatta and his campaign team. For instance, with an 89% turnout rate and an average of 85% vote share in the 27 counties Odinga won, and holding Kenyatta’s performance constant, the NASA coalition could best Jubilee this August by garnering 8,921,050 votes (55.4%) vs 7,191,975 (44.6%). Kenyatta is the favorite to win this August on account of incumbency and Jubilee’s turnout advantage. But it is also the case that the election will be close, and that even a small slip up — such as a 3 point swing away from Jubilee between now and August 8th — could result in an Odinga victory. Update: The video link now works. Many thanks to SAIS for fixing it and letting me know. The video below has been making the rounds in the Kenyan online community. The Daily Nation even reported on the claims by UCSD Professor Clark Gibson and James Long, Asst. Prof. and University of Washington, that President Uhuru Kenyatta may not have crossed the 50% threshold in the March 4th election. The duo conducted an exit poll (N = 6000) on election day that showed both candidates in a statistical tie at 40.9% for Odinga and 40.6% for Kenyatta. In the presentation Clark and James make the case that exit polling is superior to PVT because it is immune to things like ballot stuffing and tallying fraud. NDI sponsored ELOG conducted a PVT that confirmed the results announced by the Kenyan EMB, the IEBC. I do not really know what to make of this poll finding by James and Clark at the moment. I am waiting for the actual MP and Governor elections results to be published by the IEBC so I can try and see if the results in these local races were in line with the presidential results. The Kenyan Supreme Court released the full judgment (PDF) following the justices’ unanimous dismissal of Raila Odinga’s petition challenging the election of President Uhuru Kenyatta. Below are some sections of the ruling. …the failure mainly arose from the misunderstandings and squabbles among IEBC members during the procurement process – squabbles which occasioned the failure to assess the integrity of the technologies in good time. It is, indeed, likely that the acquisition process was marked by competing interests involving impropriety, or even criminality: and we recommend that this matter be entrusted to the relevant State agency, for further investigation and possible prosecution of suspects. In summary, the evidence, in our opinion, does not disclose any profound irregularity in the management of the electoral process, nor does it gravely impeach the mode of participation in the electoral process by any of the candidates who offered himself or herself before the voting public. It is not evident, on the facts of this case, that the candidate declared as the President-elect had not obtained the basic vote-threshold justifying his being declared as such. As I have said before on this blog, the justices had to make both legal and political considerations with regard to this case. I am not a lawyer and cannot comment on the legal aspects of the case/ruling. With regard to the political considerations, I think the court showed its conservative hand – opting for a strategy of letting Kenya’s new institutions grow on their own without strict supervision from the courts; notice the many references to public opinion and perception in the ruling. That is how the court interprets its mandate to “develop rich jurisprudence that respects Kenya’s history and traditions and facilitates its social, economic and political growth,” I think. No one in the mainstream Kenyan media, at least not yet, wants to talk about the failure of opinion polls to predict the outcome of last Monday’s election (For some thoughts on the election check out my post on the monkey cage blog here). A week to the election the three main polls showed the race to be neck and neck between Messrs Raila Odinga and Uhuru Kenyatta, with a slight advantage to Mr. Odinga, on average. But in the end it was not even close. Mr. Kenyatta handily beat Mr. Odinga by almost 7 percentage points (50.07% – 43.28%). In my view, the pollsters missed the mark both by not taking turnout into account (despite my unwarranted advice!) and perhaps poorly weighting the results from the different regions of the country (Kenyans largely vote along ethnic lines for various instrumental reasons; ethnic groups are geographically concentrated, with variance in size and population density). The polling firms ought to have done a better job of basing their results on likely voters as opposed to self-declared registered voters. Kenyatta’s strongholds registered voters at higher rates, and based on past elsctions, were likely to register higher turnout rates than Odinga’s strongholds- and they did (88.6% to 84%). My own pre-election predictions a month before the election highlighted this fact. In my estimation the polls consistently overestimated Mr. Odinga’s support. I eagerly await the polling firms’ own rationalization of what happened. Hopefully the misses this time won’t permanently damage the public’s perception of opinion polls. Despite the difficulties in forecasting political outcomes, it is better to have polls than fly blind into an election. Counting is still going on following Monday’s general election in Kenya. Following the close of polls the electronic tallying system for the presidential election crashed, forcing the IEBC to resort to a manual tallying system. Just under half of the 290 constituencies have so far reported. Mr. Kenyatta still holds the lead, by about 350,000. The projected national turnout stands at 82%. The IEBC has promised to release the final results tomorrow (Friday). A couple inexplicable things have happened since my last post. Firstly, the 300,000+ “rejected votes” that consistently made up 6% of votes in the initial tally have dwindled down to 40,000 – less than 1% of the total votes counted so far. The IEBC’s explanation was that there was a software malfunction in the electronic tallying that increased the rejected votes by a factor of eight. Secondly, both CORD and Jubilee coalitions have issued statements regarding the tallying process. CORD claimed that some results were “doctored.” Jubilee claimed that the UK government had sent troops to Kenya and that the high commissioner was trying to influence the tallying process. None of these claims have been substantiated. Kenyan media houses have agreed to deny live coverage to such political pronouncements. Life is slowly getting back to normal – I was glad to see traffic on Nairobi roads today! With regard to the final result, it is clear that Mr. Uhuru Kenyatta has an unassailable lead over Mr. Raila Odinga. What is not clear is whether or not he will win by a wide enough margin to avoid a runoff. Dear readers, it has been a while since I did a rant and rave post. Here is one to end the long drought. Today we look at a couple of pieces done by Al-Jazeera and the New Yorker. I love the New Yorker. Everyone does. Unless you are weird. Or do not like their politics. But the New Yorker should get a better writer than James Verini on the upcoming Kenyan elections. Reporting on the first presidential debate, Verini made several unforgivable errors. I mean, I know it is hard to find information on countries that you may or may not have visited, or have only visited for a few days. First of all, there were two moderators, not one. Unless Verini only caught the first half of the debate. I will admit that the second half could have been better. But it wasn’t bad enough to forget that there were two moderators. Julie Gichuru moderated the second half. Kenya’s first President Jomo Kenyatta was not a “Mau Mau rebel.” Also, the Mau Mau are popularly known in Kenya as freedom fighters. Dedan Kimathi, a leading light in the independence movement and Mau Mau leader, has a statue in his honor on Kimathi street in downtown Nairobi. Nairobi is not in Central Province. Nairobi is a Province on its own. Kenya has eight provinces (now called regions) – Rift Valley, Eastern, North Eastern, Coast, Western, Central, Nyanza and Nairobi. Nairobi borders Central. But it is not in Central. I swear. You can google it. 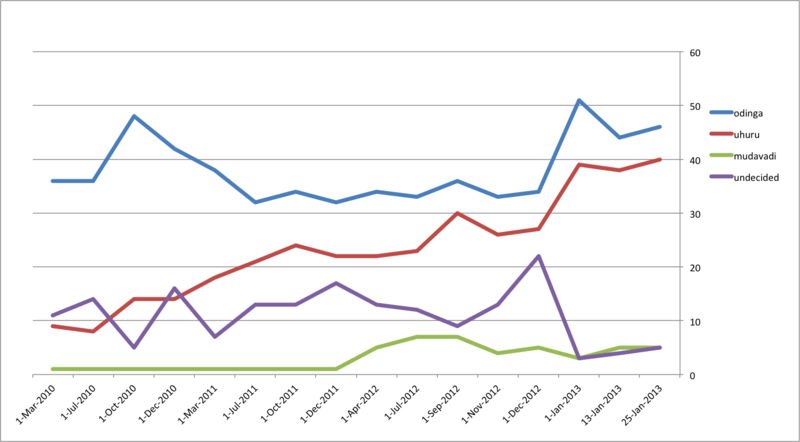 The post-election violence in 2007-08 was not mainly a Kikuyu-Luo affair. Most deaths occurred in the Rift Valley in clashes between Kikuyus and Kalenjins, over land. Police brutality was number two in cause of deaths. Kikuyu-Luo clashes were horrific. But they were not the defining feature of the PEV. The 2010 Constitution did not make the position of Prime Minister permanent. It abolished it. You can also google a copy of the Kenyan Constitution. There is a pdf online. I swear. Or you could just read the Wikipedia entry here. Political science is an imprecise discipline at the best of times. But in Kenya, it feels more akin to witchcraft. In most established democracies, astute analysts can have a reasonable stab at predicting the outcome of elections. The regular if well-spaced drum-beat of polls gives anyone who cares to look, a decent set of historical data to work with. It’s usually possible to check the voting patterns of a particular electorate; assess the impact of demographic changes; and with the help of some intelligent opinion polling, have a good understanding of the way a country might swing. But in Kenya, this election is stacked with so many unknown factors that a witch throwing newt’s eyes into a bubbling cauldron might have as good a chance at predicting the outcome as the political scientists. Witchcraft? Why that term? Why not just say that you do not have a grasp of the political reality and so don’t know how the election will turn out? Are you trying to say something about your readers (that they easily resort to witchcraft to explain things they do not comprehend) or Kenya? I put it to you that there are three firms that have been polling the Kenyan public on their political preferences since the last election in 2007. These firms accurately predicted the outcome of the messy 2007 election (and pretty much matched the exit polls conducted by UCLA academics) and the 2010 referendum. Kenya has demographic data that politicians make very good use of. For instance, we know the ethnic composition of Nairobi, the most cosmopolitan PROVINCE (hear me, Mr. Verini) in Kenya. Also, a few political scientists, including yours truly, have done some predictions as to the potential outcomes of the election (see blog posts below). Why did these two do this? To me it looks like a bad case of trying to exoticize the Kenyan elections for their audiences – what with the references to witchcraft by Mr. Greste and Mr. Verini’s over-simplification of the election to a Kikuyu-Luo tribal contest. It is also disrespectful to Kenyans, who they seem to think will not do any fact-checking to correct their sloppiness. On Monday Kenyans witnessed, for the first time ever, a live presidential debate. I must say I was surprised by how well this went. The moderators, at least in the first half of the debate, had very pointed hard-hitting questions – especially on ethnicity and the ICC question. The top two candidates, Mr. Raila Odinga and Mr. Uhuru Kenyatta, were taken to task about the apparent ethnic arithmetic behind their campaign strategies and the perceived animosity between their respective ethnic groups, the Luo and Kikuyu. Both flatly denied the charges. But it nonetheless provided a moment of open discussion of negative ethnicity, which remains as the key organizing principle of Kenyan politics – with disastrous security and economic consequences. Mr. Kenyatta was grilled on how he planned to govern from The Hague while on trial at the ICC; or whether it was legally or ethically tenable for him to be running in the first place. Mr. Odinga did not miss the moment and chimed in by stating that it would be logistically challenging to run a government via skype from The Hague. Many of those on stage – with the exception of Martha Karua and Abduba Dida – concurred that the trials should be held in Kenya and that Uhuru should be allowed to run (Today Kenya’s high court ruled that Uhuru and Ruto can run for office despite the charges at the ICC). So who won the debate? The simple answer is Mr. Kenyatta. On negative ethnicity he shared the blame with Mr. Odinga. Mr. Odinga, as the Prime Minister, was often questioned, and himself answered questions like he was the only one on stage currently in government – Kenyatta and Mudavadi are his deputies, and Kenyatta was at one time Finance Minister. As a result he took a lot of flak for the failures of the current government. Ironically, Mr. Kenyatta’s best moment in the debate was on the topic of the ICC charges against him and his running mate Mr. William Ruto. Because of the sovereignty overtones (Kenyans can “tribal”, but are also nationalist) in admitting that Kenya could not handle the cases, many on stage, including Odinga, said that Mr. Kenyatta should run – adding that the trials should be brought back to Nairobi. One of the biggest obstacles to Kenyatta’s candidacy has been the ICC question – indeed he almost quit the race over the issue. Donors have given veiled threats of sanctions. Many Kenyans thought (or hoped) that the courts would bar him. But the way the ICC issue played out in the debate reduced its significance as a wedge issue, and may influence a few undecideds. I get the sense that many left the debate with an excuse to vote for Kenyatta despite the ICC charges. The numbers have not changed much since my last analysis, save for the fact that Kenyatta’s and Odinga’s numbers have begun to converge. In the presidential debate Mr. Odinga complained that it smirked of ethnic dog whistling to try and predict the outcome of the election based on ethnic blocs (The combined ethnic blocs of Kenyatta and Ruto make up about 43% of Kenyans). His complaint exposed his biggest fear. His party did a poor job of mobilizing voters to register. While I disagree with the quality of punditry around this issue so far (the talking heads on TV often merely use raw voter registration numbers to predict outcomes) I don’t see anything wrong with trying to predict the outcome based on polling data. In essence the outcome of this election will not only hinge on how many people registered where but also on how many of them actually turn up to vote. As I have argued before, this will mainly be a turnout election. Mr. Kenyatta leads by between 650,000 – 740,000 votes based on my turnout models. But Mr. Odinga can seriously dent this lead by simply matching Mr. Kenyatta’s stronghold turnout rates. If he does that and has a good day in Western region on March 4th he will win in round one. Otherwise we are most likely headed for a runoff, after Kenyatta wins the first round. Either someone in Mr. Odinga’s campaign reads my blog (wishful thought of the day!) or they are sober with the numbers and have realized that they need a high turnout on voting day. Mr. Odinga this week launched a countrywide get out the vote drive. The latest opinion poll (Friday 15th Feb) show a dead heat between Odinga and Kenyatta at 46% and 43% respectively. Such close numbers, coupled with Mr. Kenyatta’s head-start in voter registration and historically relatively higher turnout rates in his strongholds, do not bode well for Mr. Odinga’s chances. In the last two weeks the diplomatic community in Nairobi have had a mini freak-out after coming to the realization that Mr. Kenyatta has a good chance to be Kenya’s 4th president. Many embassies insisted that they are neutral, but some also warned that the outcome would have consequences. Barack Obama, the US President, even made a youtube video urging Kenyans to vote peacefully. France bluntly stated that they would only have essential contact with a Uhuru government if he wins. Their freak-out betrays the knowledge that there is little they can do either before or after the election. Kenya gets about 5% of its development budget from donors; the rest comes from domestic taxes. Nairobi can tell them to take a hike. Plus there’s China. And Somalia and South Sudan to be taken care of by a big international community based in Nairobi. The country is the diplomatic hub of the region, and indeed the continent. Nairobi houses the biggest US embassy in Africa and UNEP headquarters, the only UN office of its kind in the global south. In short Western leverage is limited both before and after the election. In any case, the ICC case against Uhuru and Ruto appears to be crumbling. The prosecution significantly altered the charges, leading to a request yesterday for more time from the defense teams. The cases may start well after the elections in Kenya are over and done. Or they may be taken back to the pre-trial chamber and dismissed. All things considered, I would not wish to be in Mr. Odinga’s or his strategists’ shoes right now. With elections less than a month away many in Kenya are reading the tea leaves and making predictions as to who they think will win the March 4th presidential election. Unfortunately, many of these self-styled political analysts – including the most celebrated one Mutahi Ngunyi – are merely using the raw IEBC voter registration numbers and assumptions about ethnic bloc voting. The reality, however, is that there will be differential voter turnout in the many ethnic zones regions of the country in a manner that will have a non-trivial impact on the outcome of the election. As I highlighted in a previous post, this will be a turnout election. Everyone knows who their voters are. The swing voters will be few. And the two major contenders don’t appear to have any intention or strategy to eat into each other’s perceived strongholds. And so just as I did last time, I ran the numbers from the latest opinion poll from Ipsos Synovate with regional breakdowns to estimate the winner of the presidential election. This time round my turnout model also includes variables on income, voter registration, and whether a region has a top presidential contender or not. So what do the numbers say? Well, if the polls are right Uhuru Kenyatta still leads Raila Odinga by about 740,000 votes. I estimate that Mr. Kenyatta will get 48.87% of the votes cast to Mr. Odinga’s 41.72%, which means that a run-off is almost inevitable. I don’t expect Mr. Kenyatta to hit the 50% mark since my model is slightly biased in his favor (especially coming from the Rift Valley turnout figures from 2007 that I use as a basis of estimating turnout in 2013). Below I show the regional tallies according to my turnout model. Of course the polls could be all wrong, in which case none of what I say here matters. The result of the election will hinge on the turnout in the respective candidates’ strongholds. As it is my model estimates a turnout rate in Mr. Kenyatta’s strongholds at 77.33 to Mr. Odinga’s 66.68. Mr. Odinga can easily erase Mr. Kenyatta’s lead by matching his stronghold turnout rate and having a respectable showing in Western region (by eating into Mr. Mudavadi’s vote share) on March 4th. In the event of a run-off, all bets are off. Most likely the election will then centre on Mr. Kenyatta’s ethnicity (which is the same as that of the outgoing president) and his tribulations at the ICC thereby handing Mr. Odinga a lead straight off the gates. For those interested in looking under the hood of Ipsos Synovate’s polls go here. Will turnout disappoint Odinga tomorrow? Travel, conference and more travel have kept me from blogging in the last few days. I am back online. Kenyans go to the polls tomorrow. This is a post from a few days ago. I am in New Haven (great to be back!) for a conference and visiting with friends before going back to Nairobi for Monday’s election and wanted to make a quick post on the latest in the upcoming Kenyan elections. The second presidential debate was rather dull, to be honest. The candidates were, as expected evasive over the matter – mostly giving vague answers to pointed questions on scandals they were rumored to have been involved in; from Goldenberg to Anglo Leasing to Maize to typos at the treasury. The jester Candidate Dida provided a light moment when he asked the moderator if she expected thieves to admit that they had stolen. The second half was better. It dealt with the issue of land. Again, no real answers emerged but it put Mr. Kenyatta – who’s family owns large tracts of land – on the hot seat. Land is an issue that has been the cause of ethnic clashes in every Kenyan election since 1992. Voters may just have got one more thing to think about before casting their votes on Monday. Overall, I cannot say that any one candidate won the debate. However, Mr. Kenyatta lost a few points due to the amount of time spent on the land question. His main opponent Mr. Odinga even came to his rescue at one point, reminding viewers to cut Mr. Kenyatta some slack since he only inherited land that may have been dubiously appropriated by his father while he was president. As I have pointed out before, the outcome of the presidential election in Kenya next Monday will hinge on turnout. Whether we shall wake up on March 5th with a president-elect or have to go for a runoff will depend on regional turnout rates. As it is most public opinion polls point to a runoff. However, the polls do not give us a sense of what proportion of registered voters are likely to vote. One private poll that I have seen suggests that 98.3% of those polled said they would show up to vote. Such turnout numbers belong in Belarus. I expect average turnout to be between 75-85%. Below is a table with the turnout rates in the last three presidential elections. (The 2007 figures should taken with a pinch of salt, for obvious reasons). As you can see history seems to be on Mr. Kenyatta’s side. Central Kenya and the Rift Valley, the two most populous regions of the country both support him overwhelmingly (according to the latest Ipsos Synovate poll) and have the highest average historical turnout rates. Could turnout rates be different this time? New positions created in the constitution – governor, senator, and women rep – might attract new voters in addition to those who have in the past voted for the three other posts – president, MP and councillor (now county rep). This might increase turnout across the board, but since Mr. Kenyatta is already “maxing” his turnout rates Odinga might benefit from an overall increase in turnout rates. The dropping of calls for “six piece” vote. Earlier in the cycle both candidates had insisted that voters should vote one straight ticket for the party for all six posts. However, since the nominations for both leading parties/coalitions were a total mess many popular candidates did not get nominated on the “right parties.” Insisting on a six piece vote would have lowered turnout. However, without it everyone has a candidate to vote for in their preferred presidential candidate’s stronghold. This may increase turnout since it gives incentive for say someone running in an Odinga stronghold, who supports Odinga, but is not in Odinga’s party to still mobilize his supporters to the polls in competition with the candidate in Odinga’s party. Again, a higher average turnout rate will benefit Mr. Odinga. The last polls before the election (about five of them) show a slim national lead for Mr. Odinga over Mr. Kenyatta, 45% to 43% on average. But since we do not know the make up of likely voters I would be reluctant to declare Mr. Odinga a favorite going into Monday. Mr. Kenyatta’s strongholds have historically had better turnout rates than Mr. Odinga’s. Desirability biases in the survey: We do not know to what extent those interviewed lied about who they support. And on this count Mr. Kenyatta runs the highest risk. Because of the ICC cases he and his running mate face, many higher income and educated Kenyans have had concerns about their ability to run the country “via Skype.” If such people residing in the Rift Valley and Central regions lied to pollsters because they were expected to like Kenyatta then we may be in for a surprise on Monday night. If Mr. Odinga gets more than 35% of the votes in Rift Valley and about 15% in Central Kenya he will win the presidential election in the first round. Strategic voting: One of Mr. Odinga’s many challenges has been the Western Kenya region where Musalia Mudavadi comes from. Mr. Mudavadi is the third candidate, getting 6% on most polls nationally and about 34% in Western region. Mr. Odinga gets 53% in the region and Kenyatta 3%. In the event of a runoff, most of Mudavadi’s voters will break for Odinga. Mr. Mudavadi’s candidature centres on becoming a King maker and elevating his stature as a serious contender in the next elections (2017). But if Western voters who would support Odinga in the second round decide to do so in the first round Odinga will have an outright victory in the first round. Barring any surprises on Monday (esp with regard to turnout) the state of play is that the first round will be a close contest between Kenyatta and Odinga, with one or two percentage points separating them. Mr. Kenyatta is a slight favorite to win the first round, but will be short of the 50% required for an outright win. In the second round, however, I expect Mr. Odinga to be a clear frontrunner since most of Mudavadi’s voters in Western Kenya will break for him. I also expect a little bit of anti-Ruto (Kenyatta’s running mate) votes in the Rift Valley going to Mr. Odinga. I am very curious as to what President Moi’s promised major announcement on March 5th will be…. perhaps an endorsement? All in all I would put my money on Mr. Odinga becoming Kenya’s fourth president. Ipsos Synovate just released another poll on the upcoming presidential election. The poll shows Prime Minister Raila Odinga leading his deputy Uhuru Kenyatta by 46% to 40% in approval rating. 10% of of those polled were undecided. More on the latest polls this weekend after I get a regional breakdown of the data. For the historical trend in the polls, including today’s, see below. On a related note, the Guardian Africa Network has a piece on the threat of violence leading up to and after the March 4th poll. Some call such warnings fear-mongering, but I’d rather have everyone freaking out about violence and thus sort of prepared than a repeat of 2007 in which everyone – including Kenya’s intelligence services – was caught flatfooted. OK, so as promised, here is my first attempt at looking at the numbers and what they are telling us about the outcome of the March 4th general election in Kenya. 14.3 million Kenyans registered to vote this year. Out of this (based on historical turnout rates) about 11 million will actually show up to vote. If the opinion polls are right, neither Uhuru Kenyatta nor Raila Odinga (the top two frontrunners) will get the requisite 50% plus one vote required to win the election. It is likely that there will be a runoff. About 4% of voters remain undecided. The polling trend (see below) suggests that the race will tighten over the next six weeks before the election. The first opinion polls after the party nominations show Deputy Prime Minister Uhuru Kenyatta ahead of Prime Minister Raila Odinga in the raw vote, at least according to my analysis. The overall national head to head match up in the two polls released Monday show Mr. Odinga leading Mr. Kenyatta by (48-40, Infotrak) and (40-36, Ipsos). The regional poll tallies, on the other hand, show a different story. In these Mr. Kenyatta emerges with a lead of between 490,000 and 630,000 of the accounted for votes depending on the turnout models used. The average of the tallies show that if elections were held over last weekend Mr. Kenyatta would garner 4.5 million votes to Mr. Odinga’s 3.9. This leaves about 24% of the (potential) votes cast either spread out among the other presidential contenders or undecided. The surveys by Infotrak and Ipsos (the two firms correctly predicted the outcome of the 2010 referendum) gave regional tallies of how the top two coalitions did among those surveyed. With a few modifications (like assigning the GEMA counties in Eastern region the Central region poll results), I assigned these tallies to the different counties within the regions. I then estimated voter turnout using the numbers from the three most recent national voting exercises – 2002 and 2007 elections and the 2010 referendum. Because of the anomalies in the presidential election in 2007, I used the constituency turnout figures (In these figures, for instance, Juja and Nithi did not have turnouts exceeding 100% as was the case in the presidential election in 2007). Of course there are counties in which the popularity of either Kenyatta or Odinga vary by constituency but this is the best we can do for now. I then used the estimated county turnout rate and the regional polling results to estimate the expected vote count for either candidate in each county using IEBC’s figures of registered voters. It is important to note that among the two polls, Infotrak asked respondents about their preferred ticket (Kenyatta and Ruto vs. Odinga and Musyoka) while Ipsos asked about individual presidential candidates. The discrepancy in the national polling average and the raw numbers I show here might be because of incorrect weighting of the different regions by the polling companies. The fact that Kenyans vote along ethnic lines and voters are geographically concentrated means that the regional polling numbers might provide a better picture than the national numbers. National polls appear to be over-estimating Odinga’s support by about 3 percentage points on average. The first reason is that Mr. Kenyatta has the numbers. The combined GEMA registered voters number 3.9 million. That is 27.3% of the registered voters. Mr. Kenyatta obviously won’t bag 100% of these votes but it doesn’t hurt to have a vote rich base. His stronghold of the wider Mt. Kenya region had the highest voter registration rate in the country. This, combined with the fact that his running mate brings in the populous Rift Valley region, gives Kenyatta a slight edge off the gates. Kenyatta’s strongholds (Mt. Kenya) and Rift Valley have historically had higher turnout rates than the regions that Odinga will need to win on March 4th. In 2002 Kenyatta’s strongholds had a higher turnout rate by 5 percentage points. In 2007 it was 10%. The combined high population, higher registration rates and expected higher turnout means that Mr. Kenyatta is presently the favorite to win the first round of the March 4th presidential poll. A lot of voters (24%) remain spread out among the smaller candidates or are undecided. Come election day these voters may break for Mr. Odinga for the reasons I gave in an earlier post. Mr. Odinga’s other path to victory is by ensuring high turnout in his strongholds of Nyanza, Western and Coast regions. Just by matching the expected turnout in Mr. Kenyatta’s strongholds he would reduce the deficit to about 250,000 votes. He must also eat into some of Mr. Kenyatta’s support in the Rift Valley and Central regions. If the election is a mere census then Mr. Kenyatta will win the first round (the second round is another story all together). For Mr. Odinga to win he must convince voters in Mr. Kenyatta’s strongholds that he is the better candidate. For a while it seemed like this election was Mr. Odinga’s to lose. I have since softened on this a little bit. 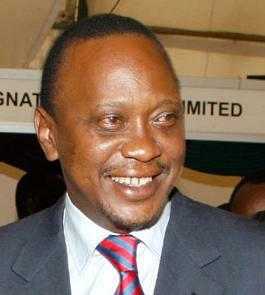 Despite his many problems, Mr. Kenyatta can still win this election, at least the first round. In the second round everything will be contingent on who between Messrs Kenyatta and Odinga can bag the roughly 20% of votes that will go to various smaller candidates in the first round. As things stand Mr. Odinga is the likely beneficiary of these votes. If turnout is low on March 4th Mr. Kenyatta will emerge the winner. His (national) base is relatively wealthier and more urban (or more accurately, more politically engaged – if you doubt this see the voter registration numbers for Kiambu county alone) than Mr. Odinga’s and thus will have a higher turnout. Having failed to match Mr. Kenyatta’s voter registration rates, Mr. Odinga needs upwards of 80% of those registered in his strongholds to show up to vote, or else he will lose. Mr. Kenyatta appeared to be the better organized candidate in getting his base to register to vote. And given the way in which his party handled the nominations exercise, it is likely that he will out-organize Mr. Odinga in getting his supporters to the polls. This spells more trouble for Mr. Odinga. The nominations exercise gave Mr. Odinga’s coalition bad press for four consecutive days. His home base of Nyanza was the worst affected. Seemingly undemocratic nomination exercises – in which Odinga’s allies controversially won party primaries – in the region may depress turnout, something that Odinga should be worrying about A LOT. Watch out for how Mr. Odinga’s party handles the nominations fallout in his Nyanza backyard. Musalia Mudavadi appears to have made gains in Western province – he is polling there at 26%. His gain is Odinga’s loss. If Mr. Mudavadi continues to gain in the next 40 days then we shall almost be assured of a run off, after Mr. Kenyatta wins the first round. The Odinga/Musyoka ticket leads the Kenyatta/Ruto ticket in an opinion poll on the electorate’s preferred president and running mate ahead of the March 4th 2013 general election. Odinga’s lead (51-39) is well outside the margin of error of the poll. 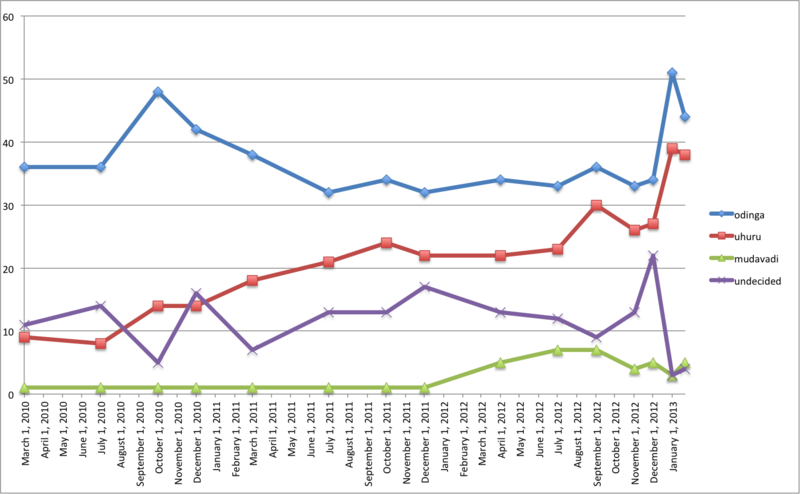 The chart below shows the Infotrak Harris tracking poll since early 2010. The most interesting data points in the poll are (1) the level of support (at 36%) for the Odinga/Musyoka ticket in the backyard of William Ruto, Mr. Kenyatta’s running mate; (2) the fact that the former Western Province is not really a swing region after all, with Musalia Mudavadi being preferred by a meager 23% of registered voters; and (3) The geographical limits, albeit in relatively higher population density areas, of the Kenyatta/Ruto ticket – the Odinga/Musyoka ticket leads in 6 of Kenya’s 8 provinces. According to my own estimations (more rigorous analyses coming after 17th of this month) Odinga/Musyoka have the lead in 23 counties perceived to be CORD’s strongholds. Kenyatta/Ruto and their Jubilee Alliance lead in 20 counties. 4 counties are truly swing. The Kenyatta/Ruto alliance however have a vote lead of about 292,000. 2.5 million votes are still up for grabs, enough to swing the election in CORD’s favor. . The latest polls continue to confirm that Mr. Odinga remains a slight favorite to become Kenya’s 4th president. But as I have said before, this will be a close election.